Not to alarm you, but you’re surrounded. There, buzzing stupidly into the slats of your venetian blinds, is a house fly. Nearby, nestled in a crevice of the window-frame, a ladybug waits out the winter. In a corner overhead, a spindly house spider sits motionless in its haphazard web. Underfoot, bristly little carpet beetle larvae nibble at the fibers of an old rug. And that’s to say nothing of the dust mites, which are too small to see and too numerous to count. Just because we don’t notice them, however, doesn’t mean they’re inconsequential. Many otherwise benign arthropods produce allergens. Indeed, they are one of the, if not the, most important sources of indoor allergens. Their shed exoskeletons, corpses, even their feces: these animals produce more than their fair share of detritus. Although, it must be said, so do we, flaking off skin cells everywhere we go. Dust mites need something to eat, after all. Mites and cockroaches, in particular, can cause serious health problems, triggering asthma in children and aggravating allergies. The extent to which exposure to this detritus primes people for allergic reactions in the first place—or inoculates against them—is a matter of continuing research. In fact, we really have no idea just how diverse the ecosystems in our own homes are. Madden and her colleagues are responsible for the first attempts to survey the full diversity of our arthropod cohabitants across the United States. 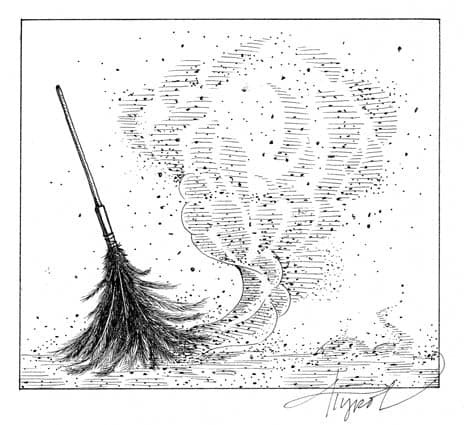 Turns out that the dust of our homes, laced as it is with organic leavings, is a treasure trove of genetic material. Using the latest in DNA identification technology, the researchers have been able to turn a single swab of dust into a functional catalog of arthropod diversity in a given home. With help from citizen scientists around the country, they compiled samples of dust from atop the doorframes of homes in every one of the forty-eight continental states, more than 700 total. From these, they were able to put together rough map of how arthropod diversity varies across the country. All told, they identified some 600 different genera. Sure enough, the familiar flies and fleas were present, but there were a few surprises: crabs and shrimp—marine arthropods—showed up as well, often enough that it seems obvious that we’re all messier eaters than we’d like to think, scattering particles from particularly delicious store-bought arthropods into the air when we have them for dinner. Also, Madden, added, “You probably have aphids.” There were more plant-associated genuses than the team expected, these tiny plant-sucking bugs among them. The data also revealed some the shifting ranges among our hangers-on. The Turkestan cockroach, for instance, is expanding its foothold in the American Southeast—but thankfully, not up here. Yet. More importantly, this research has allowed scientists to start exploring the factors that influence this diversity. Three things definitely seem to boost arthropod diversity: pets, the presence of a basement, and—perhaps least surprising—rural surroundings. These are not shocking revelations, but they provide a good foundation of knowns from which to explore the unknowns. And there are many. This is not a rhetorical question. The Dunn Lab (robdunnlab.com) is now inviting people to sign up and sample their showerheads for analysis. Kenrick Vezina is a science writer, editor, and educator based in the Greater Boston Area. He loves animals and alliteration. The illustration for this column was drawn by Adelaide Tyrol. The Outside Story is assigned and edited by Northern Woodlands magazine, and sponsored by the Wellborn Ecology Fund of New Hampshire Charitable Foundation: wellborn@nhcf.org.